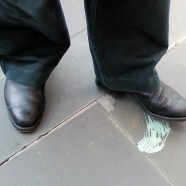 Pavements and streets can be ruined by discarded chewing gum. It’s also very tough to remove using traditional cleaning techniques. Compact Cleansing can help with chewing gum removal leaving walkways free from chewing gum. Our environmentally friendy chewing gum removal works on tarmac, stone, concrete, carpets and flooring. The process will remove chewing gum completely, without leaving any unsightly marks and, most importantly, without causing any damage to the surface being treated. Compact Cleansing offers the perfect Chewing Gum Removal Service in Lanarkshire. Interested in Removing Chewing Gum?